The Kenley Tribute commemorates all who served here between 1917 and 1959 both on the ground and in the air. The white Portland stone was sculpted by Bridget Powell and takes the form of an open book whose pages list the number of each squadron stationed here. 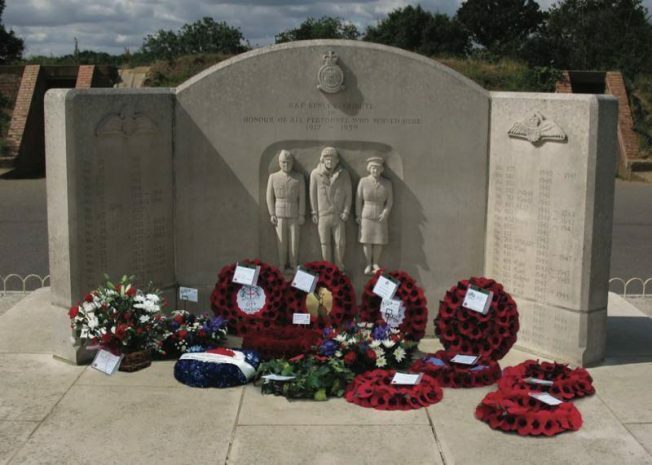 The figures on the central panel represent the ground staff, aircrew and women personnel who played such an important role in the defence of Britain. Keeping them safe, keeping them flying, the ground crew at work. When visiting the Kenley Tribute, you are standing in front of a Second World War blast pen designed to protect fighter aircraft from the effects of bombs exploding nearby. Built into the back wall is an air raid shelter that couldn’t withstand a direct hit and which doubled as a store. Ground crew had to hurry to rearm, refuel and overhaul the aircraft so they were ready for their next combat sortie. Imagine you are one of the essential staff who keep the Spitfires and Hurricanes airworthy in August 1940. Your fighter aircraft have already taken off when the siren walls signalling that the airfield is under German attack.